Not to say that there is a right or a wrong way to put on your chaps. If you have a system that works, then keep on keeping on. For newbies, we put together a quick “How To” piece on putting your chaps on and included some great fitting tips. The first main tip is: Do not worry about the chaps touching the floor during any part of this procedure. They more than likely will end up there and should if you are doing this correctly. Unzip and unsnap both legs of the chaps. 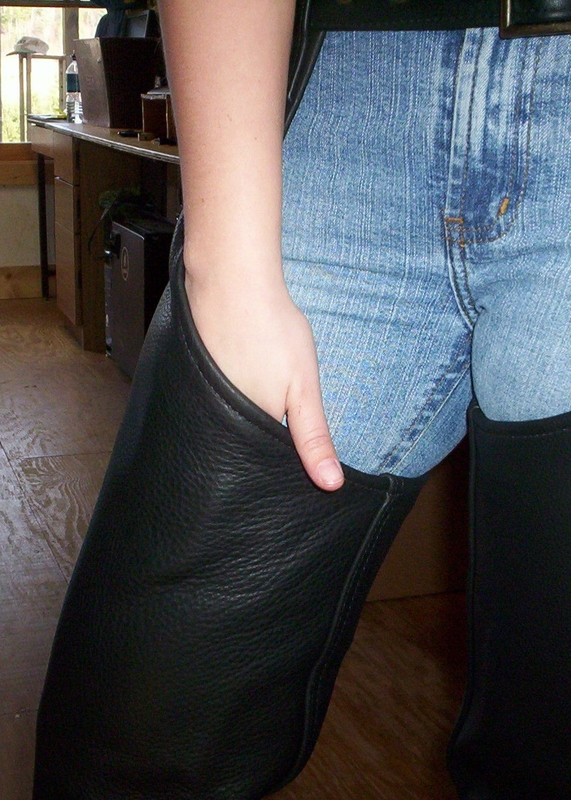 Grab the top of the chaps between the lacing and the back of the right leg with your right hand. Make sure the inside of the right leg is facing you. Use your left hand to pass the male part of the zipper between your legs from front to back passing it to your right hand and you let go of the top. Grab the female part of the zipper in your left hand. Move the zippers to the front of your thigh well below the thickest part of your thigh and zip the right leg. Position the zipper towards the outside rear of the leg. Do not pull the chaps up on your leg, yet. Pass the belt and the left leg of the chaps straight across behind you to your left leg just above the knee. Pass the female part of the zipper from front to back between the legs passing it to your left hand. Move the zippers to the front of the thigh and zip the left leg. Position the zipper to the outside of the leg towards the rear. Pull the chaps up and buckle them. Squat down and stretch them out like you are trying to bust them. Get in a catcher’s position and bounce. The zipper is on the outside rear of the leg because that is where it is most protected from wind and rain. A good fit in the thigh would be if you can (just) fit your hand between your thigh and the chaps leg. When your hand is in there, you should not be able to move it around or wiggle your fingers. You would want the belt to fasten in one of the middle grommet holes. If you are in the very first or last grommet hole, try to adjust the laces to allow for maxium fit and comfort. Just so that you know, wherever your body puts pressure on the chaps they will stretch (where there is no pressure they will not stretch). After time they will form to you and give you the lived in feel that you desire. If the chaps are too long, you can trim them to fit. We ask that you make sure that you have a good waist and thigh fit before trimming because once you trim the chaps we cannot take them back. The seams are glued and sewn to keep the thread from unraveling and of course the leather does not fray. Remember that it is better to cut twice than to cut too much. If you are unsure of the fit, just give us a call. Thanks to Chippy for the great modeling.